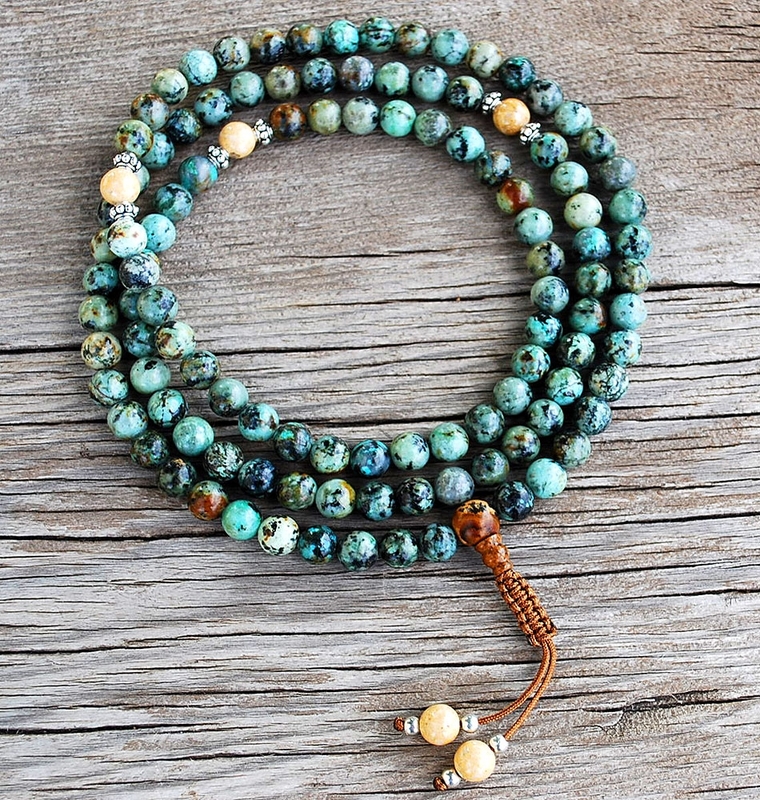 108 8mm African African Turquoise Mala with Brown Green Turquoise Beads, Riverstone and silver markers, finished with a brown Snakeknot and beaded adornments. African Turquoise is a variety of Jasper. 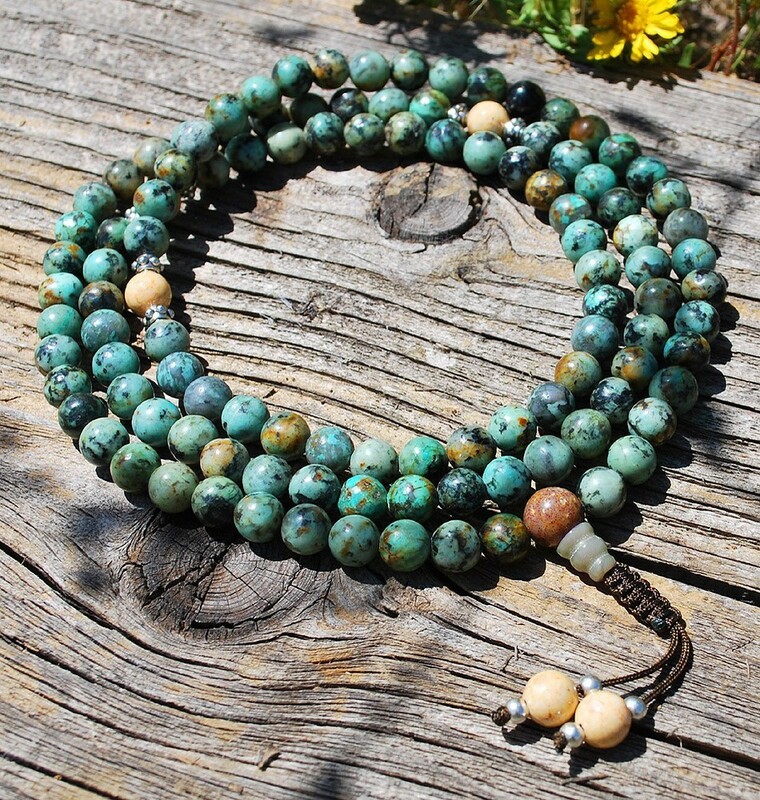 Subtle and varied blues, browns, greys, and greens are seen in our natural African Turquoise mala. Jasper is derived from the Greek for “spotted stone”, and is a form of microcrystalline quartz. The finely grained, dense jasper contains up to twenty percent foreign materials that determine its color, streak, and appearance. Jasper was cherished for its beauty and mystical properties since ancient times, and is mentioned in the Bible, used on the Great Wall of Jerusalem, and was treasured throughout ancient Greece. Jasper is found in Australia, Brazil, Canada, Egypt, India, Kazakhstan, Madagascar, Russia, Uruguay and the United States. 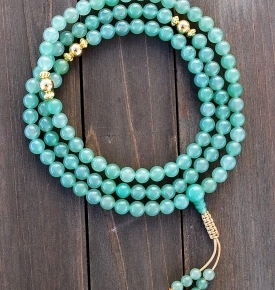 The African turquoise beads are well crafted? It is just what I wanted. I had one previously and it was stolen in a home robbery. I am so happy I could replace it with one of equal quality. 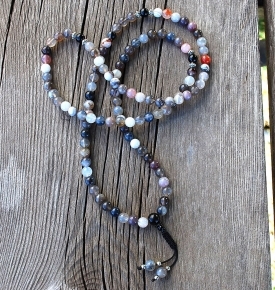 Necklace is fairly heavy (in a great way) with high quality beads. Love that it comes with an instruction/explanatory pamphlet. I am a fan of authenticity so I’d like to know more about where the beads come from and how the necklace is created, etc. 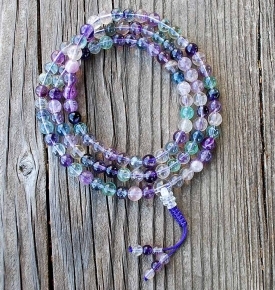 I have had this mala for several years and just love it..the colors are so unique and vibrant. 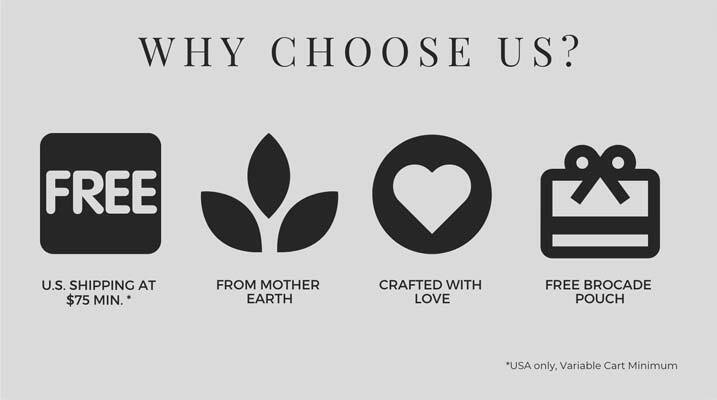 I have purchased several types of malas over the years from Sakura and the quality and service is amazing. This is my favorite one. Love it. Quality and fast shipping. Beautiful! Great beads artistically strung! Nice adjustable knot! I have one of these beautiful Malays and just purchased one for a friend for Christmas. 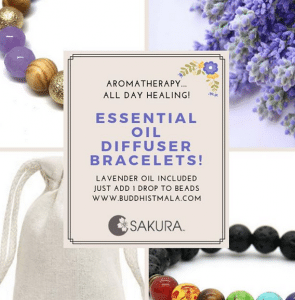 It has a beautiful soothing and grounding energy. Shipping, as always, was very fast. I love these beads, they are beautiful and exactly what I was looking for. The jasper kept calling me after looking at several sets, I’m very happy with my purchase. The process was easy and seamless! Perfect! 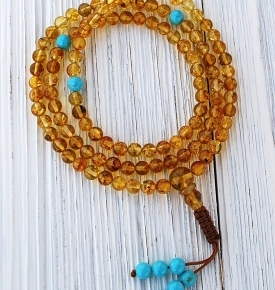 Attractive beads and well crafted with a good adjustable knot!